The word campus carries highly positive associations. We think of leafy public commons dotted with handsome buildings, alive with the energy of students engaged in invigorating discussions. College grads look back happily at their years on campus, remembering not just classes and friends but the physical surroundings with a deep fondness. The walkways they strolled late at night discussing politics or football with their roommates. The library steps where they relaxed between classes on sunny days. The tree where they first kissed their future spouse. Ever since the Middle Ages, the ideal of a university has been a lively setting where students gather in taverns, coffee shops, public plazas, and diners to discuss what they've learned in class as well as flirt and philosophize. But a lot of campuses today fall short of the mark in providing lively public places that are as important as classrooms in offering a well-rounded education. "We have a great history in the U.S. of creating world-class campuses," notes James Howard Kunstler, author of The Geography of Nowhere and other bestselling books about the state of American places, "from Thomas Jefferson at the University of Virginia and through the 19th Century and right up through the Beaux Arts period of the 20th Century. The Yale campus, for instance, is a national treasure, and virtually every school has a great old quadrangle or other good public place at its heart. But as you get away from the center of campus things begin to dribble away. At some point, things began to fall apart in planning campuses." He points to Skidmore College in his hometown of Saratoga Springs, New York. It was once located near downtown and was integrated into the fabric of the community, but moved to a self-contained campus cut off from the life of the town in 1965. "Instead of laying out the buildings to relate to one another, they all relate instead to a ring road and the parking lots." Even a recently built dorm complex, according to Kunstler, "could not have been deployed in a more meaningless organization." It bears absolutely no relationship to the landscape, he says, "and has less character than your average garden apartment in Houston. It's a stunning failure." Today there is a dawning realization that making our campuses better places for public interaction enhances the creative atmosphere for students, professors, staff and companies that partner with colleges. University officials are becoming more aware of how the look and feel of a campus influences the overall educational experience. Carol T. Christ, president of Smith College, declared in The Chronicle of Higher Education: "I have come to believe that public space is vital to building a healthy and rich sense of diversity--diversity not only in racial and economic terms, but also of political opinion, religious belief, sexual orientation, and cultural background. Such space provides an opportunity for people to disagree about matters of political conviction without personalizing the debate." 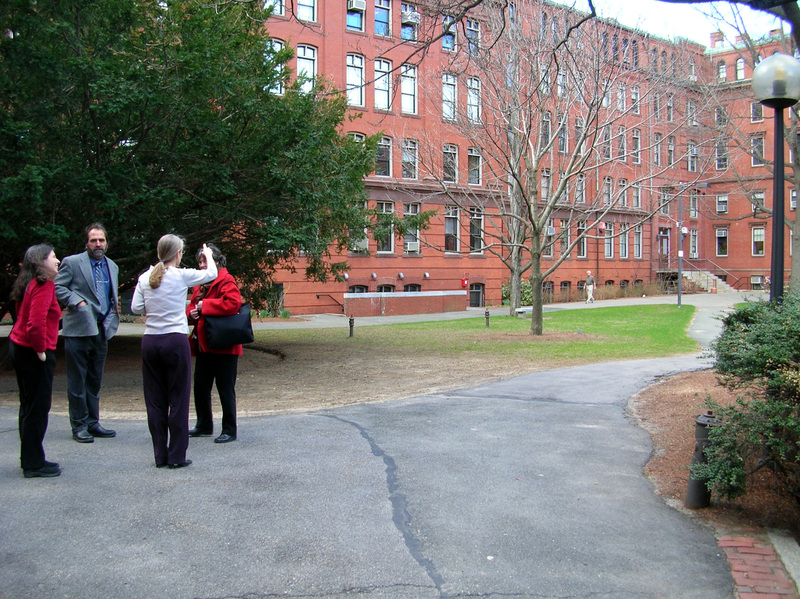 PPS workshop participants evaluate an area of Harvard's North Campus. Admissions departments increasingly realize that a lively, welcoming campus makes a good impression on prospective freshmen and their parents. Even alumni donations depend in part on keeping the campus vital and attractive for potential benefactors coming back for a visit. Placemaking, the art and science of creating good public spaces where people want to gather, is being discovered as an important element in the appeal of a college, the same as distinguished professors, famous alumni and successful sports teams. This is why Project for Public Spaces has been asked recently to work on a number of campuses, including Harvard, Stanford, Duke, and the University of Wisconsin, as well as hospital complexes (see accompanying sidebar "How to turn hospitals into healthy places for everyone"). Colleges and hospitals are not the only places where exciting innovations about campuses are taking root. The spirit of Placemaking can now be found in the "front yard of America," as Alan Hantman, the Architect of the Capitol who stepped down after a ten-year term last February, calls the campus of the U.S. Capitol. Hantman, FAIA, who now guides A. M. Hantman Associates (and worked previously with PPS to transform the Channel Gardens at Rockefeller Center), has envisioned a new feel for this sacred ground of democracy in Washington, D.C. The new plan for the capitol created a soon-to-open visitors center and refashioned a big parking lot into something more resembling a pedestrian zone where a few cars are parked. "You need to welcome people by showing this is a place that has been scaled to people themselves, not vehicles," he emphasizes. Fountains, lampposts and granite paving stones were added and attention was paid to restoring the scenic sightlines envisioned in the original plans by Frederick Law Olmsted. This project was undertaken after the deadly 9/11 terrorist attacks in New York and the nearby Pentagon, so safety was foremost on everyone's mind. "We put in security components but made sure they did not look like a fortress. You have to invite people into a place, letting them know they are welcome to walk here, to sit down on a bench, put a blanket on the grass, to play Frisbee." Phil Myrick, director of PPS's growing Campus Program, sees a wide range of major issues and opportunities facing campuses today. "These all point to the value of treating the campus as a single environment," he says, "and not just an agglomeration of facilities." Too often, faculty and students retreat into their own disciplines, each hidden away in its own separate building. This brings natural interaction to a standstill. "We need cross-fertilization and collaboration more than ever," explains PPS president Fred Kent. "Campuses as they are often built today don't allow that to happen. You can no longer isolate one department from the other. In today's world, the business school needs to interact with the medical school and the science buildings. Students need to interact with faculty and in turn the entire university needs to interact with the broader community. You need synergies to naturally occur. You do that with a campus full of strong public spaces." Students and professors are no different from the rest of us. They want to live or work in a place that is pleasant, stimulating, attractive and safe. But this has too often been ignored in the way campuses have been planned or adapted in recent decades, says Myrick. "Billions of dollars go into building facilities that hide their assets behind blank walls. If a tiny part of the investment was directed to bringing the building program to the outside, it would make a vast difference on people's experience of the campus." The key to making campuses more than the sum of their parts is an important idea that PPS calls triangulation. This simply means clustering activities together to create a busy, dynamic place for many different types of people at different times of day. For example, a terrace cafeteria at the student union could "triangulate" with a nearby garden and rotating exhibits from the campus art collection. Combining these elements that would normally be scattered creates a far busier and more exciting place than any one of those uses by itself. One test of how well a place triangulates is to evaluate how long the typical person stays there. If most people stay in a public place for 15 minutes, then what more could be added to lengthen that visit to an hour or more? Another indicator is how many different age groups use a place. If it is only people between 18 and 21, then what other activities could attract those younger and older? By the same measure, a campus that sits all by itself, cut off from the commerce and life of the local community, solely devoted to classrooms and university activities, is going to be a less rewarding experience for students. Some of America's most beloved campuses feature adjoining business districts that teem with activity. Think of Harvard Square in Cambridge, State Street in Madison, and Telegraph Avenue in Berkeley. James Howard Kunstler points to the Savannah College of the Arts in Georgia and the College of Charleston in South Carolina as two of the best campuses in the U.S. because their buildings are actually woven into the fabric of downtown neighborhoods, like many European colleges, rather than standing apart on their own separate ground. College campuses don't want to make the same mistake as corporate campuses, where an overemphasis on securing the environment means they are seldom vital places. Universities sometimes fear introducing non-traditional uses, such as farmers markets, bicycle trails or anything they see as encouraging the public to linger on their grounds. Some schools have so many restrictions on what is allowed that they wind up eradicating from the campus anyplace inviting or pleasant. In these cases, students and faculty end up the losers, denied opportunities to enjoy lively public settings. There are no easy answers to this question of control. But Myrick notes that PPS's experience working with private institutions such as shopping centers and airports as well as campuses shows that if you loosen up a bit, everybody will gain. In the end, success depends on sensible management of public uses, no matter whether it happens in a public space or more private setting such as a campus. A university and the surrounding community boost each other when they cooperate on a wide range of matters. The happy result is often a strong local economy with a highly skilled workforce and cutting edge businesses spun off through the presence of entrepreneurial professors and graduate students. But when their relationship is adversarial, both the school and the city suffer. Parking and traffic headaches, colleges' tax exempt status and rowdy student behavior top the list of community complaints, while universities express concern about poor municipal services and unchecked social problems spilling over into the campus. Richard M. Freeland, president of Northeastern University in Boston, holds up the collaboration of the University of Pennsylvania and leaders from nearby low-income neighborhoods in reducing crime, improving local schools, fixing up the neighborhoods, and promoting economic development as an inspiring example. Similar success stories happened at Yale in New Haven, Trinity College in Hartford, Marquette University in Milwaukee, the University of Southern California in Los Angeles, and Case Western Reserve University in Cleveland. Economist Richard Florida, champion of the creative class theory, which holds that cities attracting the most talented workers will fare best in the 21st Century economy, points to Iowa City (home of the University of Iowa) and Champaign-Urbana (home of the University of Illinois) as vibrant communities with low levels of economic inequality that thrive on their connections with universities. As incubators of innovative ideas, universities are poised to pioneer sustainable building practices for the future. But Myrick emphasizes that being green is not just about the facility itself but about how the building relates to the rest of the campus. A true green building, for instance, would be sited in such a way that people would typically walk there rather than drive. This is an issue that Duke University is addressing in its plans for campus expansion. "How do you create a pedestrian environment in an area that is addicted to automobiles?" asks Larry Moneta, Vice President of Duke University, who has been working with PPS on campus improvements. "How do you emphasize walking and bicycles. That's what we're working on." 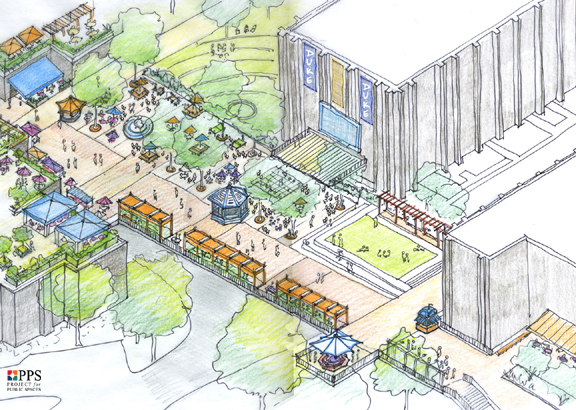 The concept plan for the new West Campus Plaza. Myrick observes that too often planners give streets too much priority. "Campuses need to be thought about in terms of destinations, how the various buildings relate, where the gathering places go, where you want walkways--and then fit the streets to that vision. In most cases this will result in a total rethinking of each street's design." He notes that PPS's upcoming work at Harvard has raised the question of how to extend the pedestrian-friendly assets of the current campus to a new branch of the university in Allston on the other side of the Charles River. "How do we get people to walk from the existing campus to the new one, a walk almost no one would want to do right now? That can't be accomplished with a 20th Century vision of transportation and of campuses. We need a 21st Century vision." Transportation in general has become a thorny issue at many campuses across the continent. A school obviously must be accessible for staff and students living off-campus, but not overrun by wide roads and huge parking facilities that destroy the intimate, pedestrian-scaled environment essential to a quality educational experience. Too much accommodating the automobile often results in campuses becoming drab, uninspiring places sealed off from the life of the community around it. Daniel R. Kenney, a principal of Sasaki Associates planning and design firm, notes that his research shows many students admit to driving from dormitories to classes even when it's just a five minute walk. "The current orientation toward driving everywhere discourages a sense of community on campuses," he writes in The Chronicle of Higher Education. "Barren parking lots can destroy the character of neighborhoods and perhaps even cause them to decline." He suggests aggressive efforts to promote bicycling (the University of New Hampshire offers free bike rentals), car and van pools (the University of Washington lets these vehicles park free, which has eliminated the need to create 3,600 new parking spaces and saved an estimated $100 million) and mass transit (the University of Colorado boosted bus ridership almost sevenfold and avoided construction of 2000 parking spaces).